View Homes of Clark County - We Celebrate World Frog Day! At Nature As Neighbors, we love the environment with all of its wonderful creatures. We are especially fascinated with frogs and will go to great lengths to ensure their survival. They are an intricate part of a healthy ecosystem, keeping down the populations of disease-borne flies, mosquitos, and ticks. Also, (somewhat ironically) they serve are a food source for snakes that keep down the population of crop-eating rodents. But, much like the canary in the coal mine, frogs are the bellwether of our environmental conditions – their decline indicates a problem with the ecosystem. 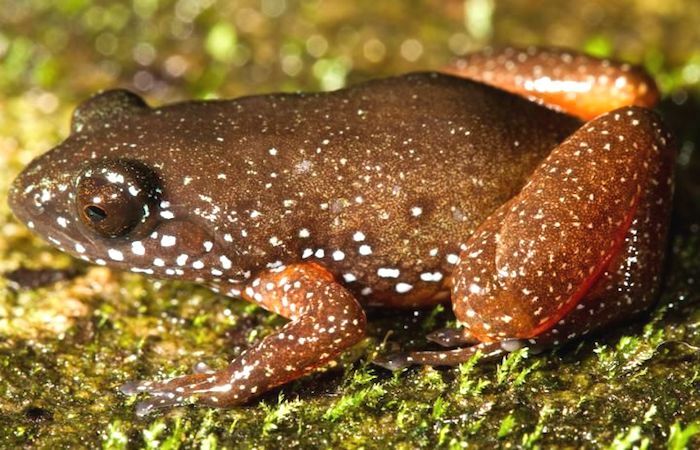 So, today, on World Frog Day, we are thrilled to read about the recently-discovered Orange-Bellied Starry Dwarf Frog. Named for its brilliant star-like coat, it is a survivor from ancient lineage that was thought to be gone. No bigger than a human thumbnail, it was extremely hard to discover, scurrying about under dead leaves in the isolated mountains of Western Ghats, India. Given its reclusiveness, we marvel at its discovery and celebrate this little creature’s tenacity for survival. With Spring just here, we hope this is a positive reminder of the amazing resilience of nature.